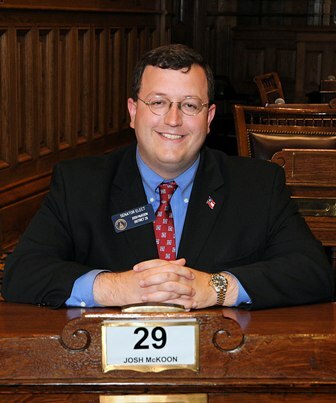 This post comes from State Senator Josh McKoon (R-Columbus), who has been a strong advocate of the Georgia taxpayer and defender of the rights of citizens, even when it runs counter to the wishes of the leadership of his own party. In this article, he explains ballot access and why it is long overdue for reform. State Senator Josh McKoon (R-Columbus). Photo credit Georgia Senate. Georgia has been recognized for having the most restrictive ballot access laws in the country. As a Republican State Senator, all I had to do this year to access the ballot was to sign a form and tender a certified check for my qualifying fee. Due to a recent change in the law, if I had wanted to run as an Independent, all I would have had to do was declare that and pay my qualifying fee. But for any Georgian who wants to run for office that is not already an elected official, they must not only file the qualifying paperwork but also gather a threshold number of signatures, one percent (1%) of registered voters for statewide ballot access and five percent (5%) of registered voters for ballot access for other offices. By the way, it is not as simple as someone signing the form. They must sign the form, provide their address, their county of residence and the date they signed the form. Each sheet, with 15 signature locations, must be circulated by one and only one person. A separate person from the “circulator,” as he or she is called, must witness and notarize the signature of the circulator. If the necessary information is outside the boxes provided, even if complete, it may be thrown out by elections officials. Routinely, independent candidates, who manage to accept the daunting challenge of gathering signatures and submitting them to elections officials, receive a letter stating they haven’t submitted enough valid signatures. They are not told which signatures are invalid, or even why they have been invalidated. To contest such a finding a would-be Independent candidate needs to hire a lawyer to have a chance to successfully navigate the system to get a favorable decision. Just this year I represented three such candidates, along with my colleague Bin Minter, who merely wanted to have the chance to serve their fellow citizens in county level offices. After dozens of hours of work and two separate hearings, these three candidates are on the ballot, for the moment. One of them may need us again to contest an appeal to the Georgia Court of Appeals so votes for him will count when they are cast on November 8. Over the years there is one question I have to ask about all of this: why? In an era of unrivaled apathy among our population, why on earth would we maintain barriers to people that want to get involved with their government? The answer is simple enough – elected officials benefit from the current system. Less competition means less of a threat to their next re-election bid. Conservatives are always talking about the free market and how competition makes everyone better. Is there some exception when it comes to the free marketplace of ideas and officeholders? I think not. In addition to candidates that wish to run on an Independent line, Georgia law has made it incredibly difficult for third parties to obtain ballot access. Prior to 1943, a party needed only to submit a slate of candidates to get a ballot line. Now the byzantine requirements are so burdensome that a judge recently held the ballot access law unconstitutional as applied to Presidential candidates. If, in my case, I believe the Republican Party has the best policy ideas, why should I be afraid of running against a Constitution Party, Green Party, or other third party candidate? Unless I am afraid I cannot persuade a majority of voters that our ideas are the best, there is no reason for me to fear competition. And increasing the number of voices in our political debate means more ideas get heard and that we have a greater quality of discussion over a larger number of topics. This is good and healthy for a democratic process. The only argument ballot access restriction defenders can really make is that Independent candidates do not have to run in a primary and so are guaranteed general election ballot access in a system that does not restrict them while party candidates must win a primary. So here is my solution: Allow everyone to run for any office upon filing of the paperwork and submission of their qualifying fee. Have a “jungle primary” where everyone runs together in one election instead of having multiple party primaries. This also eliminates another problem when voters are interested in voting for one person in one party primary and another person in another party primary. They cannot do that under current law but having one unified primary election would resolve that while also eliminating the Independent advantage as to access to the general election ballot. The top two vote-getters in the “jungle primary” would advance to the general election in November. Georgia should want to lead the nation in welcoming diverse voices to the table when it comes to running for office. Eliminating onerous ballot access requirements is not only the right thing to do, it will lead to a more robust debate about public policy and help insure in the long term better solutions to the challenges facing our state are thoroughly discussed and vetted. It is time to tear down the walls to ballot access and give Georgia voters the same robust choices at the ballot box that they already enjoy elsewhere in our free market economy.